Harry Raul was born in Easton, PA, and enrolled in Lafayette College in 1905 with a major in Classics. He soon left the campus to pursue studies with several noted sculptors both in New York and in Philadelphia. He returned to Easton and was a sculptor from 1911 until 1917 when he became chief adjuster of the Bureau of Labor and Safety of the Bethlehem Steel Company. 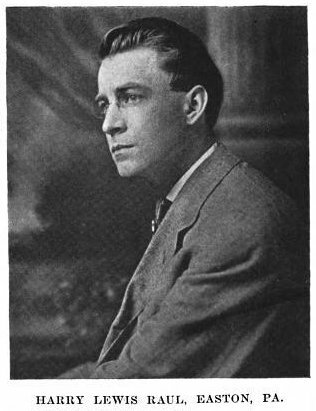 In 1918 he conducted research in foundry techniques for the Taylor-Wharton Company in Easton. Raul also had an art studio in Easton and worked as a free-lance sculptor from 1918 to 1939. His work includes “The Martyrs of the Maine Monument,” a tribute to the martyrs of the battleship Maine and the soldiers, sailors and marines of the Spanish-American War, which was dedicated on June 22, 1914, in front of the Northampton County Courthouse. He also designed the World War I memorial in Wilson Borough. The Traill Green monument at the entrance to Easton Cemetery was designed by him as well and it was unveiled with great fanfare in 1911. Near the chapel is “The Guardian,” a memorial to his parents. In 1939 Raul moved to Washington, D. C. where he became the museum curator at the Interior Department Museum. Later, Raul was a guest lecturer on art and sculpted works in many cities, museums and private collections.